This image provided by the Potsdam Institute for Climate Impact Research in April 2018 shows observed ocean temperature changes since 1870, and currents in the Atlantic Ocean. A study released on Wednesday, April 11, 2018 suggests flobal warming is likely slowing the main Atlantic Ocean circulation, which has plunged to its weakest level on record. The Atlantic Ocean circulation that carries warmth into the Northern Hemisphere’s high latitudes is slowing down because of climate change, a team of scientists asserted Wednesday, suggesting one of the most feared consequences is already coming to pass. The Atlantic meridional overturning circulation has declined in strength by 15 percent since the mid-20th century to a ‘‘new record low,’’ the scientists conclude in a peer-reviewed study published in the journal Nature. That’s a decrease of 3 million cubic meters of water per second, the equivalent of nearly 15 Amazon rivers. The AMOC brings warm water from the equator up toward the Atlantic’s northern reaches and cold water back down through the deep ocean. The current is partly why Western Europe enjoys temperate weather, and meteorologists are linking changes in North Atlantic ocean temperatures to recent summer heat waves. The circulation is also critical for fisheries off the U.S. Atlantic coast, a key part of New England’s economy that have seen changes in recent years, with the cod fishery collapsing as lobster populations have boomed off the Maine coast. Some of the AMOC’s disruption may be driven by the melting ice sheet of Greenland, another consequence of climate change that is altering the region’s water composition and interrupts the natural processes. But the full role of climate change in the slowing ocean current is not fully understood, and another study released Wednesday drew somewhat different conclusions. This study, which was also published in the journal Nature, found that the AMOC has slowed over the past 150 years, and similarly found that it is now weaker than at any time in more than a millennium. The two studies have their differences: The second suggests the slowdown probably began for natural reasons around the time of the industrial revolution in 1850, rather than being spurred by human-caused climate change, which fully kicked in later. But like the first study, the second too finds that the circulation has remained weak, or even weakened further, through the present era of warming. The AMOC circulation is just one part of a far larger global system of ocean currents, driven by differences in the temperature and salinity of ocean water. 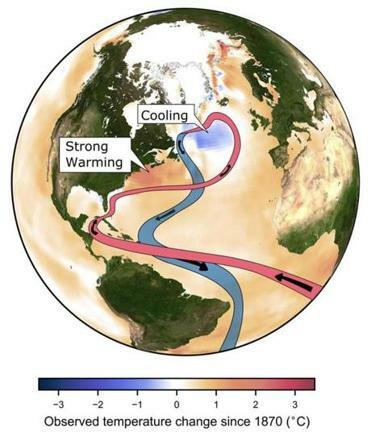 Warm surface waters flow northward in the Atlantic, eventually cooling and - because cold, salty water is very dense - sink and travel back southward at great depths. The circulation has thus been likened to a conveyor belt. But the melting of Arctic sea ice and Greenland’s ice sheet can freshen northern waters and interfere with sinking. Recent research has in fact confirmed that meltwater from Greenland is lingering on the ocean surface, where it could be interrupting the circulation. Direct measurements of the circulation are only a little over a decade old. And while those have shown a downturn, that’s too short a time period to detect a definitive trend. So the new studies sought to infer the state of the circulation from more indirect evidence. The research finds that the odd alignment, which has produced regions of both record cold and also record warmth right next to one another, has been developing since the 1950s and closely matches what a very high resolution climate model predicted would occur. The study was led by the Potsdam Institute’s Levke Caesar with along with co-authors at institutions in Germany, Greece, and Spain, as well as from the U.S. National Oceanic and Atmospheric Administration. The second study, meanwhile, draws on sediment samples from the deep ocean off Cape Hatteras, North Carolina to infer the strength of the current going back well over a thousand years. Because a stronger current can carry thicker sand grains, the study was able to detect a weakening beginning around 160 or 170 years ago when the ‘‘Little Ice Age’’ in the Northern Hemisphere ended. That trend has then continued through the present. Meric Srokosz, an oceanographer at the National Oceanography Center in Britain, noted that the two studies have ‘‘somewhat different messages’’ - but emphasized that neither makes a direct measurement of the circulation. ‘‘Essentially, what view you take of the results depends on how good you believe the models used are and likewise how well the chosen proxies represent the AMOC over the time scales of interest,’’ he said. Marilena Oltmanns, an oceanographer at the GEOMAR Helmholtz Center for Ocean Research in Kiel, Germany, went further, saying that the two studies may not be entirely measuring the same thing. The authors of the first study believe the shift in the circulation may already having a big impact along the U.S. coastline. ‘‘Of all the U.S. waters, this region has definitely warmed the fastest in the last decade,’’ said Vincent Saba, a marine biologist at the National Oceanic and Atmospheric Administration and one of its co-authors. And that has had major impacts on fisheries. The Gulf of Maine, for instance, has seen a giant boom in the local lobster industry and crash of the cod fishery. It’s not just fisheries: If the slowdown trend continues, it is expected to drive strong sea-level rise against the Eastern Seaboard. Previous research has already shown that in 2009 to 2010, sea level in the region suddenly shot up five inches, thanks in part to a brief slowdown of the circulation. This occurs, Rahmstorf explains, because the northward flow of the Gulf Stream pushes waters to its right - which means that the ocean piles up against the coast of Europe. But as the current weakens, some of the water flows back toward the United States’ East Coast instead. As for the future, Rahmstorf predicts the circulation will only weaken further as climate change advances. It may not be slow and steady: There is great fear that there may be a ‘‘tipping point’’ where the circulation comes to an abrupt halt. This is one of the most infamous scenarios for abrupt climate change, as it is known: Studies from the planet’s history suggest that such a sudden change in the North Atlantic has occurred many times in Earth’s past, perhaps as recently as about 13,000 years ago. But it’s not clear how close the tipping point might be.